The Delta Nu Alpha Transportation Society Nashville Chapter recently awarded scholarships to five Mike Ilitch School of Business supply chain management students. The scholarship winners were Rachel Cryanski, Karolina Kusza, John Floyd, Corbin Henderson and Rachel Jones. The total value of the scholarships won was $7,000. 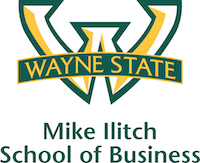 John C. Taylor, chair of the department of marketing and global supply chain management, said these scholarships provide critical support for supply chain students and help bring national recognition to Wayne State’s growing programs in this field. Floyd also won the Council of Supply Chain Management’s local chapter $4,000 scholarship to attend the council’s national conference in Atlanta in September. This conference draws the top supply chain leadership of Fortune 500 companies for a week of educational and networking events. The student attendees will receive extensive recognition, attend a variety of educational and networking sessions, and be featured at a supply chain career fair on site. Delta Nu Alpha (DNA) is an international organization of professional men and women in all areas and at all levels of transportation and logistics. The cornerstone of DNA’s success is its emphasis on education, financial assistance and mentoring for students. It also provides excellent continuing education opportunities for the work force and vigilance in communicating changes in regulations. In addition to a strong international organization, DNA has chapters in locales all across the continent. DNA also owns the Journal of Transportation Management. The Council of Supply Chain Management (CSCMP) is the leading global association for supply chain management professionals. CSCMP members represent a wide range of supply chain management industries including consulting, demand planning, finance, logistics and transportation, manufacturing operations, purchasing and procurement, real estate, sales and marketing, technology, third party logistics services and warehousing.